The David Roberts Slide collection is a collection of glass slides generously donated by David Roberts to the British Caving Library. It is believed that they originally came from his uncle and aunt, Mrs. and Mrs. Gilbert. Kath Gilbert was the Treasurer and Distribution Officer for the British Speleological Association, while Mr. J.C.Gilbert was the BSA Chairman. They were both active cavers, based in Derbyshire, and were involved in the original explorations of Lancaster Hole - indeed, Kath's Way is named after Mrs. Gilbert as it was she that originally identified the strongly draughting blockage. Some three years after Eli Simpson's death in 1962 they moved up to Skye. Kath Gilbert died in 2004, and the slides were donated to BCL by David Roberts in April 2012. An interesting article about Mrs. Gilbert written by Peter and Julie Mohr appeared in the RRCPC Newsletter Volume 36 Number 3. The photographs appear to have been taken in the late 1940s and early 1950s. 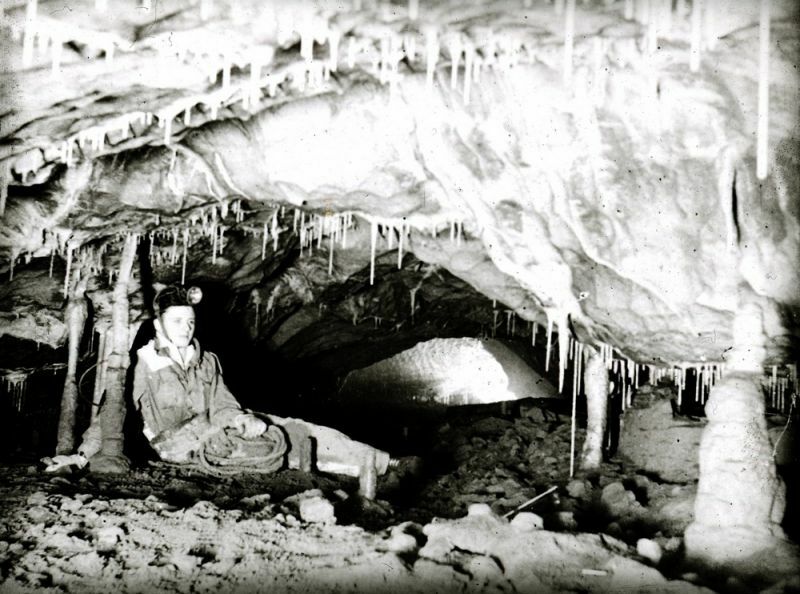 Those in Lancaster Hole and Ease Gill Caverns were taken in the very early days of their exploration, and are interesting in that they shew what the popular passages looked like in the early days, as well as providing an insight into the equipment in use at the time. At least some were taken by Bob Leakey with George Cornes supplying the human element. The collection is held at the British Caving Library. Further details may be obtained from the BCL Librarian, and the material may be inspected by prior arrangement at the BCL Library premises in Glutton Bridge. A subset of the slides have been scanned and are available online at the BCRA Online Archive.